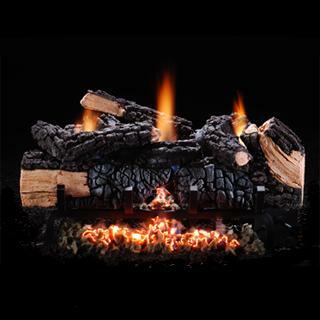 We carry a wide selection of gas log products. 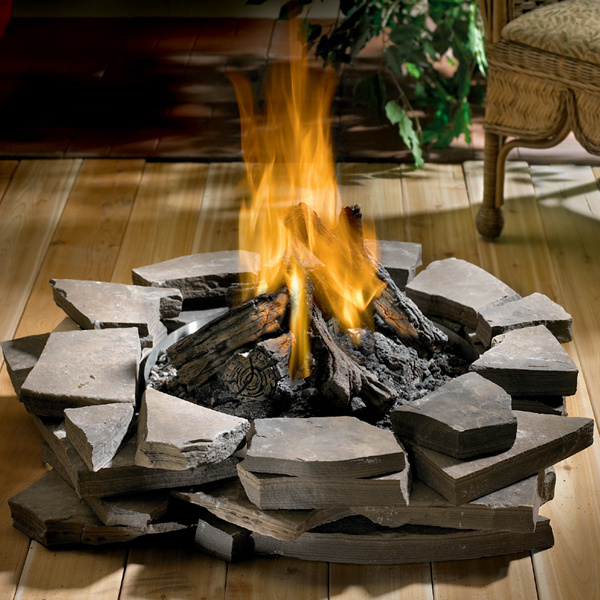 Vented, ventless (or vent-free), firepits, and more. In Natural Gas or Propane. Let us know if you are looking for somthing not listed. 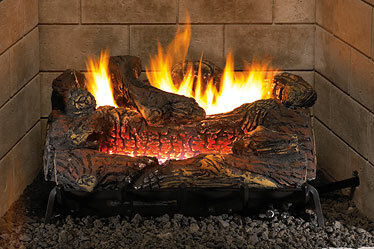 There are several types of gas log sets available on the market. The most common choice is vented of vent free (ventless)? The following are the pro's and con's of both. Larger flame can be more realistic (and fuel consuming). Typical gas consumption is usually 2 to 3 times more then vent less. Not intended for real heating - the flue must remain fully open during operation causing the same negative efficiency found in a traditional open fireplace. It may stay warm in front of the unit but is constantly drawing a large volume of furnace heated air out of the house which is continuously replaced by outside temperature air through cracks and usually makes rooms further from the unit colder and the furnace work more. Logs can soot up over time requiring messy cleaning. Real heat - 99% efficiency means all the heat stays in the house and no air gets lost up the chimney. A great backup for power outages where gas is still available. Able to install where no vent is present, and able to close the vent in a vented fireplace to keep the heat in. Built in safety in the pilot and valve shut down gas input if oxygen levels in a room become too low and in any situation where a gas leak could occur due to malfunction. Initial cost to purchase is greater (but you are getting a lot more). Can develop more problems but most common ones are related to dust in the pilot and can be easily solved by keeping it clean and dust free. Not as realistic because a large inefficient flame can never be vent free but recent log design has made leaps in life-like looking vent free units. Can not be put in too small a room per manufacturers specs or unit will malfunction and shut down irregularly and can produce excessive moisture in the form of water vapor, a by-product of combustion (meaning you can't put a large unit in every fireplace like you could with a vented unit).